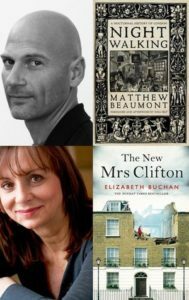 On Thursday 5th May, three Clapham writers, Elizabeth Buchan, novelist, Dr Matthew Beaumont, literary historian and Julie Anderson, your blogger, gathered at Omnibus Arts Theatre, Clapham to discuss ‘Place and the imagination – how location impacts upon the writer’. There was only a small audience, not surprising for a paid-for event at two o’clock on a Thursday afternoon, with the sun shining outside on the Common for what seemed like the first time in ages. Nonetheless, the people who were there were interested in the subject and had lots of questions – which prompted more discussion. Matthew’s phenomenal erudition is worn lightly and Elizabeth is so experienced at this sort of event that there was little for your blogger to do but make the occasional link. A little research prior to the event had yielded lots of information about writers of Clapham since the sixteenth century, some 55 fiction writers of relative fame. These included some eminences, such as Samuel Pepys, E.M.Forster, Kingsley Amis and J.K.Rowling, while others were more obscure. There was a Clapham writer on the ‘Mayflower‘. He, Edward Winslow (1595 – 1655 ), who resided in Clapham, along with other Puritans, went off to the New World where he proceeded to write his home thoughts from abroad and eventually became Governor of Plymouth Colony. Dissent and dissenters formed a large part of our discussion. Elizabeth argued that dissent and the freedom and independence of thought associated with them was the presiding genius, or genius loci, of Clapham, the spirit of the place which energised writers. She cited Winslow and the, later, Clapham Sect writers as examples. Matthew concurred, placing Clapham in the wider context of London. One key element of this was the Common itself, an open space of commonly owned land which was protected from developers. Lizy cited Matthew’s description of ‘militant pedestrianism’ in the 18th and 19th centuries, a phenomenon which is recurring today, witness the attempts of societies like the Clapham Society and its members to limit the use of the Common by private events companies, which pay rent to Lambeth but appropriate large swathes of the land with hoardings and fences for their own use. We also discussed the more recent phenomenon of psycho-geography. Defined, by Georges Debord ( of the Situationist International of Paris in the 1950s, where psycho-geography was first named ) as ‘the study of the specific effects of the geographical environment (whether consciously organized or not) on the emotions and behaviour of individuals’. Thus, the influx of the monied classes, many bankers, into Clapham in recent years fits with Ackroyd’s theory, it dovetails with the area’s existing history. The Thornton, Hoare and Barclay families were part of the wealthy influx in the 18th century, who formed the nucleus of the Clapham Sect and, eventually, changed the world. Even Wilberforce himself was from banking stock. Will today’s newcomers work for the same level of social reform, I wonder? Matthew read a wonderfully onomatopaeic passage capturing the soundscape of the old walled medieval city of London and Elizabeth read a very moving passage from the opening of her new novel. There were lots of questions from the floor and a good group discussion ensued. Then, it was all over. Hands were shaken, books were signed and everyone went on their way – often to another Festival event. Your blogger was relieved that it had gone so well. The leaflet accompanying the event can be found here – Leaflet1. The Clapham Literary Festival continues today and tomorrow, the remaining Programme can be found here. 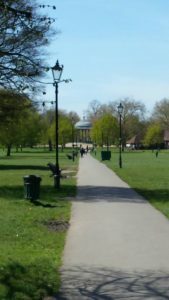 Gallery | This entry was posted in Clapham Literary Festival 2016 and tagged Clapham Literary Festival 2016. Bookmark the permalink.